Pine Knoll is the highest point in the Southern section of the ranch and boasts an 360 degree, panoramic view of the East Zion area. The trail up the face of Pine Knoll traverses narrow spine fractured limestone and red sand. The horse knows the way, so sometimes its best to close your eyes and hold on! Plenty of time is taken at the top of the Knoll for some great photo ops! The deep canyons of the Zion Narrows can be viewed to the west, with Checkerboard Mesa to the south and the 10,000 foot peaks of the Dixie National Forrest to the North. This trail ride is not for beginners but can be enjoyed by anyone who has a few rides under their belt. Zion National Park is located in the heart of Southern Utah's color country and is Utah's most popular national park for horseback riding tours. Zion National Park was first discovered by Native Americans who refused to enter the enchanted walls of the Park at night. Early Mormon pioneers hired Indian guides to tour them through the Park on horseback. More than a century later, Zion remains home to some of the most scenic horseback riding tours and trails in the Western United States. 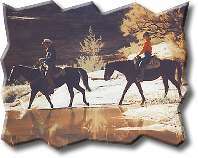 All horseback rides at Zion Ponderosa Ranch Resort are conducted by East Zion Adventures. Our horses are chosen and trained to match the wide variety of guests that visit the resort. It is important to let your wrangler know about your past riding experience so he can team you up with the best horse possible. Many of the rides on the ranch are steep and demanding so it is important for our horses to be young enough to make the climb, as well as obedient for safety.